For a product of Intuiface's breadth, I can't blame users for failing to catch every small feature. In this Tip of the Month I thought I'd point out some of the lesser known features of Intuiface. The loading indicator is the little graphic displayed by Intuiface when large media (e.g. multiple Full HD images) are in the process of loading. You'll see the indicator in Edit Mode but it's also displayed by Player (and in Play Mode) so your audience may see it as well. We give you three indicator options. 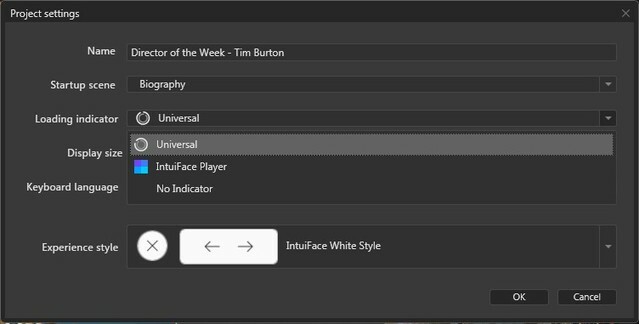 In Composer, open the menu item Project -> Project Settings and - for the "Loading indicator style" property - choose from the "Universal" style, the "Intuiface Player " style and no indicator at all. While in Edit Mode, hold down the space bar on your keyboard then left-click-and-drag an empty part of the scene you're editing. It's a quick way to move the scene around. Don't be shy to use zoom and drag in order to focus on specific parts of your design. Used an image, video, document or other graphic content on multiple scenes and decided that content needed to be replaced? You don't have to visit each scene individually to make the change. Go to the Content Library, right-click the content you wish to change and select the option "Replace with". Whatever you choose will be propagated to all assets using that item throughout your experience. In addition to referencing media in the Content Library, the Image, Video and Document assets can take absolute file paths and URLs as values. The trick is to type these references directly into their respective "Image", "Video" and "Document" properties. Be careful with absolute paths. The path has to be the same for every PC running your experience. I get the impression that the majority of our users think of the Audio asset as something to use to play background music. Why not sound effects, like turning a page or clicking a button? Just use triggers and actions to play the appropriate sound file as needed. We've even created a "Sound Effects" bundle of Design Accelerators that you can use. Preinstalled with Composer is the "Basic Shapes" design accelerator bundle. In it you will find circles, ellipses and rectangles of different colors. Each exposes all dimensional properties, meaning you can turn circles into ellipses and rectangles into lines. We often use rectangles to create color-shaded backgrounds for Group collections. Building an experience for a table? You may want to incorporate the "Flip Screen" action, one of the actions available for the "Overall Experience" in the Triggers and Actions panel. When you call this action, the entire experience rotates 180 degrees, right before your eyes. Very helpful if you have an audience sitting opposite you. Another action available for the "Overall Experience" in the Triggers and Actions panel is "Log interaction". Use it to write information to a text file on the PC running your experience. Why would you do this? Think if it as a poor man's analytics feature. For example, use this action to write a unique identifier any time one of six options is selected by your users. At the end of the day you can tally up which options were the most and least popular. Group collections are a great way to build data sheets and other visual constructs that group a lot of related graphic media. They're particularly useful as a template for interface assets. 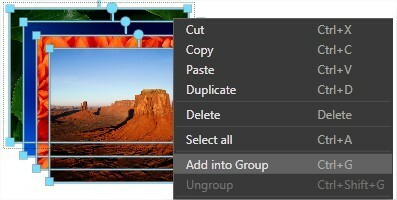 To quickly create a Group collection, multi-select items in the active scene (using click+drag or shift+left-click), right click the multi-selected items and then choose the "Add into Group" option. Your Composer license - whether Free, Essential, Premier or Enterprise - let's you run multiple instances of Composer at the same time on the same PC. By doing so you can move content - via copy/paste - between two or more experiences. Now you're on the road to becoming an Intuiface expert!